SCOTTSDALE, Ariz. – Feb. 1, 2016 – Barrett-Jackson, The World’s Greatest Collector Car Auctions®, kicked off its 45th anniversary year with their biggest event of 2016, achieving record car sales and charity auctions, as well as delivering star-studded entertainment from Jan. 23-31, 2016, at WestWorld of Scottsdale. During the automotive lifestyle event, 1,469 vehicles sold for over $102 million (unaudited) at a 99% sell-through rate and over 1,400 pieces of automobilia sold for nearly $3 million (unaudited) bringing the total sales to over $105 million. Approximately 350,000 people attended the 45th Anniversary Auction, including many of today’s most recognizable celebrities. The 2016 Scottsdale auction included a variety of entertaining exhibits and attractions that included activities for the entire family. Ford, Chevrolet and Dodge conducted Ride ’N Drives and Thrill Rides in their latest vehicle line-up. Some of the hottest entertainers in the industry, as well as from the sports industry and corporate world were also in attendance; the list included Hollywood greats Michael Bay, Jay Leno, Burt Reynolds and Frankie Muniz, three-time Grammy Award-winners Zac Brown Band, Detroit rocker Ted Nugent; two-time masters champ Bubba Watson; pro rally driver Ken Block; NASCAR greats Tony Stewart, Jeff Gordon, Brad Keselowski and Joey Logano; 16-time NHRA Funny Car champion John Force; MLB players Marco Estrada, Jacoby Ellsbury and Paul Konerko; and NHL players Shane Doan and Mike Smith of the Arizona Coyotes, as well as Andrew Ladd of the Winnipeg Jets. Velocity and Discovery Channel aired 37 hours of live auction coverage in Scottsdale. Established in 1971 and headquartered in Scottsdale, Arizona, Barrett-Jackson, The World’s Greatest Collector Car Auctions®, is the leader in collector car auctions and automotive lifestyle events. The company produces auctions in Scottsdale, Arizona; Palm Beach, Florida; at Mohegan Sun in Connecticut, and Las Vegas, Nevada. With broadcast partners, Velocity and Discovery Channel, Barrett-Jackson will feature live television coverage in 2016, including broadcasts in over 100 countries internationally. Barrett-Jackson also endorses a one-of-a-kind collector car insurance for collector vehicles and other valued belongings. 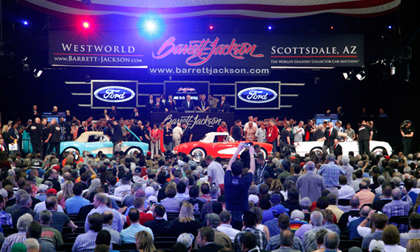 For more information about Barrett-Jackson, visit http://www.barrett-jackson.com, or call (480) 421-6694.